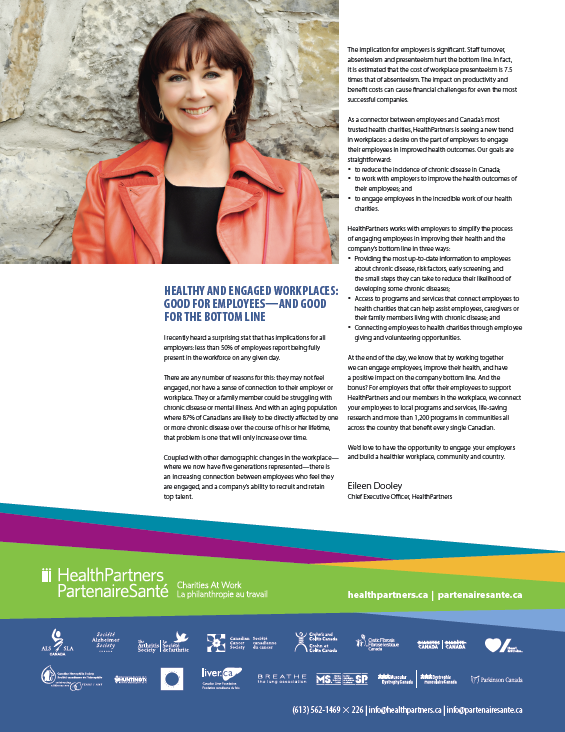 HealthPartners strives to build healthy workplaces, healthy Canadians and healthy charities. We do this by marshalling the strength and resources of our 16 partner health charities — the most trusted and well-known in Canada — to help workplaces engage their employees, promote wellness programs that create healthier employees and workplaces, and ultimately improve the lives of Canadians, especially the 87% who will be touched by chronic disease or major illness during their lifetime. HealthPartners works with employers and employees to: reduce the rate of chronic disease in our country; help employers engage their employees in managing their health outcomes; and find new resources for our health partner charities to save more lives. National, with local impact in every province and territory including in the National Capital Region. Small Steps program -- This program is designed to highlight how we can take responsibility for and control of our own health. Through small steps centred on five health pillars — nutrition, hydration, physical activity, sleep and mental well-being — Canadians of all ages can work to improve their health and, ultimately, help reduce their risk of chronic disease. health charities. These programs and services help people we know and love manage their disease/illness and improve their quality of life. Donations also go toward ground-breaking research designed to improve and save lives. Volunteers are a major piece of the puzzle at HealthPartners. Without volunteers — who share their stories, serve as ambassador health advocates and help to raise awareness — we would be unable to create healthy workplaces, healthy Canadians and healthy charities. There are numerous opportunities to get involved as a volunteer with HealthPartners or with one of our partner organizations. Volunteers are critical to the work carried out by our 16 national health charities and by HealthPartners. HealthPartners runs workplace charitable giving campaigns in both the private and public sectors all year ’round, as well as the annual Government of Canada Workplace Charitable Campaign (GCWCC). In addition, we partner with provincial governments (e.g., New Brunswick, Prince Edward Island) to help run targeted giving campaigns. These campaigns are used to inform residents in that particular province about the community programs, services and life-changing research being undertaken by our 16 partner charities, and to highlight the impact that donations have on improving people’s health and well-being. Pictured are some of Statistics Canada staff who participated in our Healthy Selfie Challenge in 2016, the first year for the challenge. HealthPartners supports Canada’s 16 largest and most trusted health charities, which conduct events across the country, in your neighbourhood and community, throughout the year. We also support and organize wellness programs in workplaces across the country. These programs include our Small Steps program, which is designed to make a real difference in the health of individuals by showing people how they can take small steps to improved health.